Should the African Union be accountable and answerable to the African Court on Human and Peoples’ Rights? The African Court on Human and Peoples’ Rights (the Court) has recently delivered a judgment in the case of Femi Falana v The African Union. The judgment is rather controversial on various levels. Firstly, the Court decided to interpret Articles 5(3) and 34(6) which, read jointly, imply that individuals or Non-Governmental Organisations (NGOs) can have access to the Court only if the state from which they are has deposited the declaration accepting the jurisdiction of the Court in accordance with Article 34(6). This was certainly not the issue in the Falana case. What had to be determined was whether the African Union (AU), which is not a state party to the African Charter on Human and Peoples’ Rights or the Protocol establishing the African Court (the Protocol), could be sued and such an interrogation required the interpretation of Articles 3, 30 and 34 (1&4) of the Protocol. Secondly, the Court, at the very onset, failed to consider whether or not it has jurisdiction ratione personae and decided to proceed to judicial consideration of the applications which is procedurally flawed. However, the purpose of this article is not to critically analyse the legal basis of the judgment, but to bring up an important question for debate. 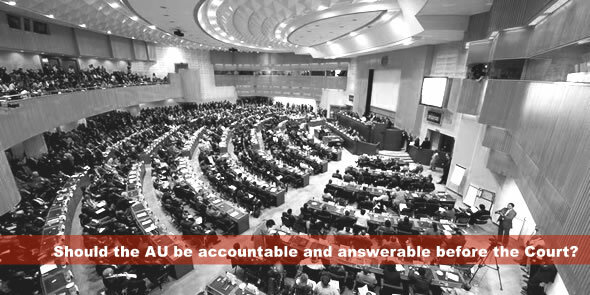 Should the AU be accountable and answerable before the Court? The respondent in the Falana case was quick to point out that the AU is not a party to the Protocol or the Charter and actions cannot be brought against it before the Court (paragraph 44). Legally speaking, this is true. However, it is argued that the complete inability of an individual, an NGO or a state to bring an action against the AU before the Court is not healthy for equal protection of human rights in Africa and for the accountability of the AU as the inter-governmental organisation of Africa. The Court seems to agree with the position of the International Court of Justice that inter-governmental organisations have duties and responsibilities entrusted to them by member states and they have to discharge those functions effectively as was mentioned in the Advisory Opinion of the ICJ on Reparation for injuries suffered in the service of the United Nations (para68). What happens if the AU fails to deliver in line with the long list of objectives and principles enshrined in Articles 3 and 4 of the Constitutive Act of the AU? For instance, one of the organs of the AU is the Assembly of Heads of States and Government. According to Article 9(1) (a) of the Constitutive Act, one of its functions is to determine common policies for the Union. Currently, no matter how realistic, achievable and beneficial to the African people those policies are or are not, the Court does not have a say in this matter. The Court does not have the jurisdiction to deliberate on whether or not those policies are in line with the African Charter on Human and Peoples’ Rights or any other African legal instruments simply because the AU cannot be brought to justice. The same unfortunately applies for the decisions and declarations of the Assembly. For making the AU answerable to Africa and its people, it is proposed that necessary legal amendments should be made for it to accede to the Charter, the Protocol and also the Protocol to the African Charter on the Establishment of the African Court of Justice and Human Rights to be considered for adoption by the AU Assembly during the July 2012 Summit in Addis Ababa, Ethiopia. It is to be noted that accession of the European Union to the European Convention on Human Rights (ECHR) has already become a legal obligation under Article 6(2) of the Treaty of Lisbon as from December 2009. The AU should draw inspiration from it and analyse the rationale given for such an accession. One of them is the possibility of applicants bringing actions against the EU and its institutions for alleged violations of the Convention rights. If the promotion and protection of human rights is to be genuinely on the African agenda, such a possibility should be given to African people also. If the AU accedes to the Charter as an entity, Africans would be able to make the AU answerable and accountable for its actions. African states which refuse to provide a legal avenue to the Court to their citizens through Article 34(6) would still be answerable in the form of members of the Assembly of the AU. The AU adopted the African Charter on Values and Principles of Public Services and Administration in January 2011 with its Article 3(8) aiming to institutionalise a culture of accountability, integrity and transparency. Being the public servant of Africa, should it not lead by example by itself being accountable to a Court of law? Roopanand Amar Mahadew is currently undergoing doctoral studies at University of Delhi at the Department of Political Science. His research topic is land grabbing in Africa. Prior to this, he was legal researcher at the African Committee of Experts on the Rights and Welfare of the Child at the African Union Commission in Addis Ababa, Ethiopia. He is a graduate of the 2011 LLM class in Human Rights and Democratisation in Africa at the University of Pretoria.